The Whistler Film Festival announced yesterday that Daniel will make an appearance at the festival which runs from 28 November - 2 December in Whistler, B.C. 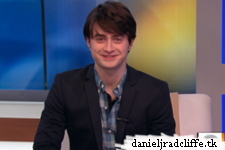 He will discuss his 2013 projects Horns (which he has finished filming then), The F Word and Kill Your Darlings. The Whistler Film Festival shines the spotlight on actor DANIEL RADCLIFFE (Harry Potter film series, Kill Your Darlings, The F Word, Horns) on November 30th in an intimate evening conversation that will speak to the exciting career of the r espected young British stage and film actor. We have watched him mature on screen in the eponymous role of Harry Potter, the most successful film series of all time, in which he starred in all eight films, and now he has a tremendous year ahead which includes three highly anticipated films and a return to London’s West End stage. Can We watch this on live in internet ?